Bearberry Extracts : Bearberry extract is made from the leaves of the bearberry plant. It is commonly used as an astringent in cosmetic preparations and skin care products. Astringents are cleansers that remove dirt and oil from the skin's pores. It is also used as a lightening agent to fade freckles or skin discoloration which may be caused by sun damage or hormonal conditions. Isopropyl Myristate : is used in cosmetic and topical medicinal preparations where good absorption through the skin is desired. 100% Natural Dead Sea Black Mud & Minerals from the Dead Sea In Jordan. 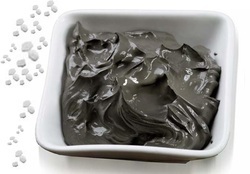 The Dead Sea Mud Mask cleanses, moisturizes and removes impurities from the skin leaving it freshly glowing. It Also stimulates blood circulation and it is effective in the treatment of rheumatism, Also It Helps to Reduces The Effects Of Psoriasis, Eczema, And Other Skin Disorders. 100% Dead Sea Mud Body lightening makes your skin brighter and more healthy. Dead Sea Mineral Mud lightening ​Mask - This luxurious product uses natural minerals to polish the body, improving skin tone and elasticity. The result is complete purification, whitener and skin comfort. Samples :(Test Samples 100gm In Sachet ),Fully Charged 180 US$ for the Sample to be wired TT Bank to Bank , Fee's of transfer on buyer account .